Most of the time, you say their names as if they were swear words, as if they burned your lips on the way out. You shake your head as they are introduced. You consider them roadblocks in the way of winning. They are the men to blame, and fans don't miss a chance to do so. “Freeman” or “Harper.” Much of the time, you consider them enemies of the state. You know, the heroes of Sunday's impressive 19-17 victory over the Kansas City Chiefs. Ah, what a win this one was. If you are measuring victories, this is the one you start with. Kansas City had won 10 in a row at home. They were impressive across the defensive line. They were amazing in the secondary. Beating Chicago a week ago would be one thing, but playing with the Chiefs would be something else, right? Consider this: It was the Bucs first win over a team that had won at least seven games since the final game of the 2012 season. And here they came: The Unexpecteds. Over the course of the season, there were already Wanted posters out on Conte and Aguayo. Winston and Koetter? Well, they would at least have been brought in for questioning. They are, after all, the coach and the quarterback. Did you see Chris Conte's Play of the Week coming? Of course not. Conte had spent a lot of time this season chasing receivers across goal lines. Who thought he would cut in front of receiver Chris Conley five yards deep in the end zone and ramble 53 yards with a lead-preserving victory? Conte? Really? Without that play, the Chiefs take over the game right there. Instead, Tampa Bay drove down and scored the clinching touchdown. It was his second huge play (he had a pick-six last week) in two weeks. The Bucs have won both games. For the record, Conte had seven tackles Sunday. Fellow safety Bradley McDougald had six. "I was just doing my job," Conte said. "I was just patient on that play. It's a play that we've seen before in practice, so I was ready for it ... They had a play-action fake and he threw me the ball." And how about Aguayo? The suspicions of Aguayo had lingered since his horrible start on the season. It still seems fashionable to suggest the Bucs overpaid something fierce by using a second-round draft pick on Aguayo. But since lining up for a winning field goal against Carolina, Aguayo has now hit 10 of 11 field goals. He hit four in a row Sunday, and the Bucs needed them all. He hasn't been as heavily criticized as the others, but the doubts were starting to grow about quarterback Jameis Winston, as well. He was too inaccurate, right? He didn't throw a crisp enough deep pass. But Winston was terrific against the Bears, and he was better Sunday against the Chiefs. He hit 24 of 39 passes for 331 yards. Over his last three games (one of them a loss to Atlanta), Winston has hit 70 of 109 passes for 904 yards, a rating of 104.68. You want to boil Winston's game down to one play? It was third-and-three at the Bucs' own 30 with 2:11 to go. Without a first down, the Chiefs had an eternity to pull out the game. Instead, Winston threw to Mike Evans for 14 yards. By the time the Bucs gave up the ball, there were only eight seconds to play. It was a crucial assault on the clock, and it squeezed the oxygen out of the Chiefs. It was the Bucs' fourth win in five road games. You want to boil the essence of Winston down to one day, however, and it was Wednesday, the day he left a letter in each of his teammate's locker telling them how much it means to him to be their quarterback. That meant tons. But the way he's playing on Sundays meant more. Who else? How about Koetter? His team started out 1-3, and too many key players were injured. But unlike some coaches, Koetter is not a man to remind you of how difficult the road is or how many players are hurt or how good the other team is. His job is to win, and he seems to understand that. Yes, the Bucs should have beaten the Rams, and they could have beaten the Raiders. Instead, his team fell to 1-3, and it kept losing key players. But the Bucs have rallied. The road ahead is difficult, but a win like the one over the Chiefs makes it look possible. The thing you like about this win was the big plays from different parts of the field. Conte was impressive. Winston was incredible. Cecil Shorts played well. And so forth. Could this have been a signature win for the Bucs? Well, it depends on what happens from here. 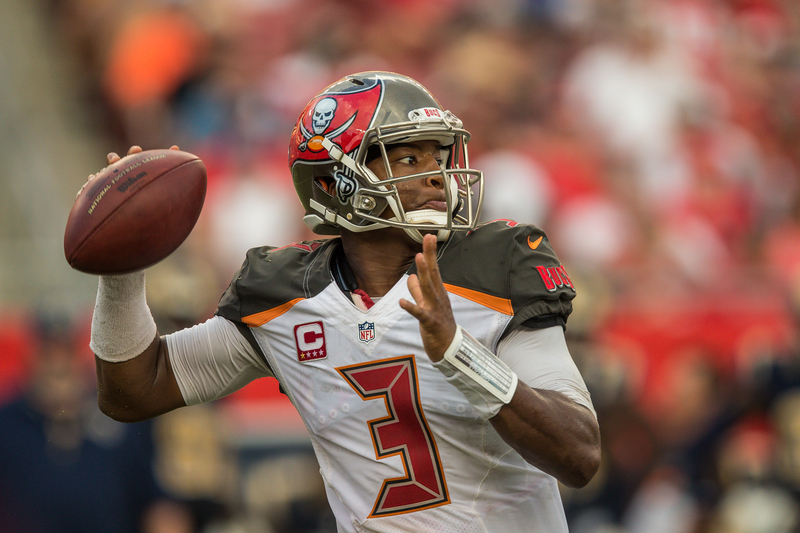 If the Bucs finish stronger than the oddsmakers would say, it has a chance to be. At this point of the program, a chance is the best you can do. A chance means hope. A chances means possibilities. After years without one, it's a better place to be than no chance at all. I think comparatively what makes Aguayo’s day so incredible, was the horrible day by his fellow kickers around the country!! ON an NFL record day when 12 extra points were made…Aguayo has a perfect game. DC comics fans will get this; We lived on the Bizarro planet Sunday. I wrote about Roberto for Tuesday. He’s been on a tear since Carolina, but no one has noticed because we’re all too busy covering our heads when he kicks. Yes…….”a chance means hope”! Tampa Bay fans really are starved for that hope! Kudos to the whole Buc team for the last two wins! But who they are is still in doubt until they are more consistent. I am sure that the rest of the schedule looks more like winning chances than it did a few weeks ago. The rest of the NFL will should not under estimate the Bucs ability to pull off a win from here on out I bet! Seattle in our house should be another real test . GO BUCS! Previous post: Random thoughts: Did Jackson lose his Heisman?